Harmony Public Schools, run by the Cosmos Foundation, is the largest Gülenist Terror Group (FETÖ) charter network in Texas and the U.S., currently operating 57 schools. With trading companies and businesses around the world from the U.S. to Central Asia, from Africa to Europe, the charter schools of the Gülenist Terror Group (FETÖ) are the among the primary sources of the terror group's financing. No matter what part of the world the terrorist group, which perpetrated the July 15 coup attempt that took 253 lives and wounded more than 2,700 people in 2016, sneaks into, the operational scheme is the same. Whether in countries with relatively more arbitrary legal structures or in countries with strictly institutionalized law, their educational institution system has been a lucrative gateway to build an economic powerhouse for FETÖ and its profiteering businessmen. Texas is the state harboring the largest number of FETÖ-linked chartered schools in the U.S. Harmony Public Schools is the largest FETÖ charter network in Texas and the U.S., currently operating 57 schools, while an additional six schools are run under the name of the School of Science and Technology (SST). Mark Hall, a Houston-born Texan currently residing in Austin and the director of "Killing Ed," a documentary that investigates the operations of Gülen-linked charter schools and exposes their network of businesses, told Daily Sabah that Soner Tarım, the co-founder of Harmony Schools, has also applied to establish Royal Public Schools in Texas. Tarım was the CEO of Harmony until December 2017. But why did the Gülenists feel the need to found charter schools to enhance their presence in the U.S. in the first place? To answer this question, it is first necessary to understand the conditions that gave birth to the concept of charter schools in the country. The idea of forming innovative educational institutions as an alternative to public schools was born in the 1970s and developed throughout the 1980s. The first charter school laws passed in Minnesota in 1991 and California in 1992. In the form of more autonomous public schools, charters schools are subsidized by the government and receive 64 percent of what their district counterparts get, averaging more than $7,000 per pupil. According to information provided by senior Turkish officials to Daily Sabah, these charter schools earn about $500 million per year. The book "Empire of Deceit: An Investigation of the Gülen Charter School Network," which was published by U.S.-based lawyer Robert Amsterdam's law firm, claims that Gülen charter networks routinely use affiliated Gülenist vendors, whom they purposefully overpay to siphon public funds out of the schools and into the Gülen organization by way of apparent kickbacks from businesses. They also serve as H-1B visa sponsors and job creators for Gülenists. It is not surprising how profitable these charter schools are considering the flow of state funds, which basically come from American taxpayers, receiving large amounts of funding. Soner Tarım, the head of Harmony Public Schools, announced on Twitter in February that the Texas Education Agency had granted Harmony $1.75 million as part of the agency's 2019-2020 Principal Preparation Grant. To manage these schools and provide some services like cafeterias, the schools' management company can hire vendors. This structure of subsidy and subcontracting services gives opportunities to Gülen-affiliated charter school companies like Accord in California, Concept Education Services in Ohio, Apple Education in New Jersey and the Cosmos Foundation in Texas. In Texas, Atlas Construction and Trading Inc., owned by an infamous Gülenist, Yunus Doğan, is the preferred contractor for Harmony schools. According to the account in Amsterdam's book, Doğan's companies received $16 million between 2007 and 2012. While Atlas was granted $12 million, its subsidiary Apple Catering received approximately $2 million; and Atlas Food and Beverage received nearly $2.4 million. These catering firms provide services to Harmony schools. Vice President of Atlas Construction Inci AkpInar, Chairman of Atlas Construction Yunus Doğan, Head of the Houston Holocaust Museum and board member of Royal Public Schools Benjamin Warren, Nancy Li Tar›m and former CEO of Harmony Public Schools Soner Tarım. Atlas also received construction contracts from the Dove Science Academy (Sky Foundation) in Oklahoma and the LISA Academy in Arkansas, both Gülen-affiliated charter networks within the greater Texas region. 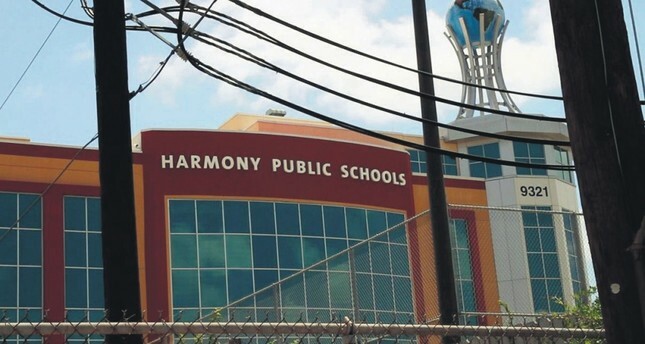 In 2012, the Texas Education Agency published an audit of Harmony's federal program spending, finding that Harmony misspent $186,000 in federal funds. A bizarre incident was reported concerning Folwell Dunbar, who audited another FETÖ-linked charter school, Abramson in New Orleans, due to complaints regarding deficiencies at the school. When he wrote his report pointing to the operational deficiencies at Abramson, he was approached by İnci Akpinar, the vice president of Atlas Construction, to fix the problem and offered a bribe. Accounts and reports confirmed that an executive from Atlas Construction, Akpınar, would speak on the school's behalf. This points to the somewhat opaque connections that links Abramson with other schools and businesses founded by Gülen-affiliated people. Although Harmony Schools' foundation Cosmos does not run Abramson, it has a wide-ranging support contract with the Pelican Education Foundation, the local nonprofit that operates both Abramson and the Kenilworth Science and Technology Charter School in Baton Rouge, a New Orleans paper wrote in 2011. Mark Hall underscored the corrupt business of Yunus Doğan and İnci Akpınar in their involvement with the charter school and other businesses. When Doğan's company hired a builder to renovate it, there were some restrictions on the remodeling in the lease contract. But the two acted in violation of the contract, which caused a spat between the real estate agent representing the owner of the building and Akpınar. "Yunus and İnci threatened a real estate agent in Houston, and İnci got into a fist fight with this woman who represented the owner of the building although what they were doing in the building violated the contract," Hall said and added, "You would not see such fights in American business dealings." Hall referred to a photo of Yunus Doğan and İnci Akpınar taken with Benjamin Warren, the head of the Houston Holocaust Museum and on the board of Soner Tarım's new charter school chain Royal School, Nancy Li Tarım and Soner Tarım. He mentioned the photo to question Doğan's possible involvement in the renovations at the Houston Holocaust Museum. Doğan's activities are not only limited to the U.S., but reach to the North African country Algeria. Atlas Algeria constructs residential and commercial buildings and hotels in addition to schools and libraries. In July 2016, Atlas was contracted for a housing project of 4,400 apartments in the Miftah region without entering into a tender competition, but with the approval of Algerian President Abdelaziz Bouteflika, who is now about to be removed from office. The value of the contract is estimated to be $109 million. Books written by Fethullah Gülen were donated to a library constructed by Atlas in the capital Algiers; Gülen was the mastermind of the July 15 coup attempt in Turkey, running his terror group from Pennsylvania since 1999. According to a report by the Demirören News Agency (DHA) in 2007, around 30 Turkish workers had been victims of Yunus Doğan. The workers who went to Algeria for the hotel construction by Atlas were not paid for their work for the company and were treated badly by Doğan and other executives who confiscated their passports. Doğan's Texas-based company Atlas Construction is also the contractor for the FETÖ-linked Raindrop Foundation, the Texas-based Gülenist cultural association affiliated with Harmony Public Schools. Yunus Doğan was spotted at an iftar dinner event organized by the Raindrop Foundation almost 20 days prior to the July 15 coup attempt. Doğan was photographed with Mehmet Okumuş, the CEO of the Raindrop Foundation and the principal of SST, along with other FETÖ-linked figures. Meanwhile, a former executive of the FETÖ-linked foundation Raindrop was brought to Turkey on Nov. 16, 2018. Mehmet Salih Gözegir was deported from the U.S. on Nov. 15 after he was found guilty of the sexual abuse of children. Why does U.S. allow Gülen schools? When asked why the U.S. administration allows the illegal and corrupt activities of FETÖ-linked charter schools and their affiliates, Mark Hall drew attention to a very significant political fact. The Central Intelligence Agency (CIA) and the U.S. Department of State basically position these movements as moderate and peaceful to infiltrate regions where U.S. interests are to be pursued or at stake, Hall said. "When the Soviet Union fell, a vacuum emerged in Turkic countries in the Central Asia, and there was a growing concern over the Iranian Shia expansion into the region," Hall said. "Therefore," he said, "The Gülen movement became instrumental to manage the Turkic countries and cripple the impact of Iran." U.S. policy toward Central Asia or Africa is still being shaped by the people who have had the same stance since 1990s, Hall noted, adding, "The world is changing but the American policy in those regions does not." Although Gülenists are backed by high-level senators and people in the State Department, Hall noted that most Americans understand the threat from the Gülen movement and what took place in Turkey on July 15, 2016. "We do not want Turkey to see the whole American public as Gülen supporters," he concluded.